Media Center is the first pavilion in the park on the way from Red Square and is the most crowded space of Zaryadye. Here you will find a tourist information center, two modern media complexes - Soaring and Time Machine, an exhibition hall, a souvenir shop and a cafe. In front of the entrance to the Media Center, as well as inside the pavilions, there are information stands "Moscow Now" - interactive terminals with a billboard of cultural events of Zaryadye and information about all the sights in the park. On the lower ground of the pavilion a multifunctional exhibition space for temporary expositions is located. Exhibition hall every third Thursday of the month admission is free. Soaring, the first such media complex in Russia has a 13 meters high semisphere screen and wind, water splash and smell generators that empower effect of presence in the sky. Get ready for breathtaking city views, the finest examples of centuries-old and modern architecture, national parks and the feeling of real flight. The media complex was created by Dynamic Attractions (Canada) and KRAFTWERK (Austria) — audio & video experts whose portfolio is filled with the most fascinating attractions in the top-tier parks all over the world. The first film created by Red Square GC for Zaryadye Park. Take a seat, fasten your aircraft style belt and let the show begin. You'll drift by Victory Park on Poklonnaya Hill, the memorial to the Great Patriotic War; soar over the Triumphal Arch commemorating the 1812 Patriotic War, Krymsky Bridge, the first major suspension bridge in Moscow; the Cathedral of Christ the Saviour, the most important cathedral for the Russian Orthodox Church, and other Moscow landmarks. Production of the film required purpose-made shooting equipment and took several weeks with five months of pre-production. Shooting team spent more than 50 hours in the air so that we could treat our guests with 8 minutes of concentrated joy. Tickets and session schedule you can find here. The new film by Red Square GC which premiered in the park on November 4, 2018. Welcome to the unique journey, during which viewers fly over the ancient pillars of Manpupuner (Komi Republic) and the Lena Pillars Nature Park (Yakutia), jump from the dam of the Sayano-Shushenskaya HPP, the largest power station in Russia; fly over the Valley of Geysers in Kamchatka. And that isn't all: get ready for landmarks of Sochi, Volgograd and much more! Please note that in order to get a free ticket you must contact the ticket office. At the park box offices, tickets to Soaring are available for purchase only for the current day. Tickets for the current and the next day you can buy on the website, via the official mobile app and kiosks at the park. Please note: tickets for some sessions can only be purchased at the Media Center and the Nature Center box offices. Ask about other discounts at the Tourist Information Center. Welcome to an amazing tour of Moscow’s past! Have a look at the moment of city's foundation by Yuri Dolgorukiy, find yourself among Mongolian invaders and salute Yuri Gagarin with the crowd upon his arrival in Moscow. You'll see how Zaryadye and the Kremlin appeared and how white-stone walls of Kitay-gorod was constructed, how Dmitry Donskoy who took his nickname after the great victory in the Battle of Kulikovo was coming back to Moscow, how Napoleon saw the city burn to the ground, how the Metro, the Seven Sisters, and Zaryadye Park were built. The film was created by Channel One. For their ambitious show, creators used a special 4-lens camera that delivers an unbelievably detailed 360-degree video. Our guests will be the first to watch such large-scale panorama in Russia. Immerse yourself in history in our spacious hall with an interactive floor, a 5-meter-high panoramic screen, a 32-channel sound system and wind, smoke and smell generators. You don’t have to be seated — walk free just like the participants of key events of Russian history. Production of the show involved 300 actors, required 500 authentic costumes and 300 items of stage prop, from hairpins to equestrian equipment. Actors learned how to wield a sword, wear a pointy helmet, and use a Soviet radio-gramophone. Some of them had to apply a complex prosthetic makeup — take Yaroslav Berezhnov for example, the actor that played Yuri Gagarin. He spent hours in the spotlights while the chronicle of Gagarin arriving in Moscow was reconstructed in a breathtaking manner. Get ready for a fascinating trip through Moscow history — and history of Russia. Experience the events of the past standing right in the place they happened! Sessions run every 30 minutes on weekdays and every 20 minutes on weekends. 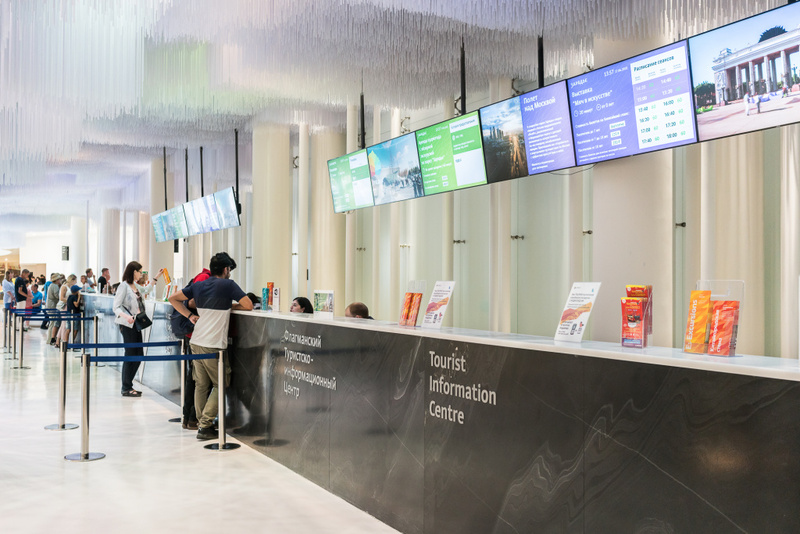 A joint project of Zaryadye Park and Moscow Department of Sport and Tourism, the Tourist Information Center is the best place to start a trip around the park, the city, and even the country. It is the part of Zaryadye Hospitality Center. Administrators will tell you in Russian or English about all the events in the park, help you buy tickets, plan walking routes around the park or the city center. Here you can pick up a guide, book a tour on a tourist bus or boat, or plan a trip around Russia. You will see the main architectural objects of Zaryadye, get acquainted with the diversity of Russian nature from the northern landscapes to the steppe and meadows, learn about the features of their content in the city. The history of the ancient Zaryadye district also will not be ignored. The Kitaygorodskaya wall will help participants to learn how fortifications were being built in the 16th century, what kind of defensive and siege combat technique was at that time, in which events the wall played an important role and how it was used by citizens in peacetime. Acquaintance with the concept of the park and its unique botanical collection, which allows you to visit different parts of our country without leaving the city. Available for booking in 2019. For further information about tours please call +7 (495) 531-05-32 (weekdays 10:00 a.m. – 9:00 p.m.). 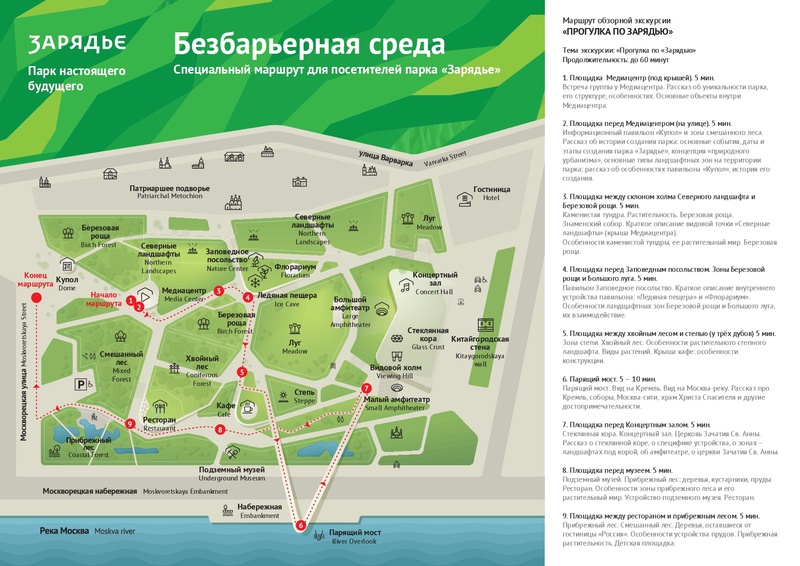 The rules for conducting tours at the Zaryadye Park for third-party guides you can find here (in Russian). The special route for visitors with disabilities and parents with strollers, where we tried to make the transportation between points as comfortable as possible. You can go this route on your own – download the map with a description of the points here. - providing audio guides for use at Zaryadye Park. About prices please ask the Tourist Information Center staff. The Exhibition Hall for temporary exhibitions is located on the first basement floor of the Media Center. The expositions, organized together with leading Russian museums and cultural institutions, are devoted to different regions of Russia, its history and culture. Between March 16 and April 21 the Exhibition Hall hosted the On the Flourishing Shores of the Crimea exhibition. The project brought together exhibits that represent different aspects of the culture of the Crimea. These were pictural and graphic works, photographs, costumes, and household items from several museums. The main masterpieces of the exhibition were Ivan Aivazovsky's canvases “Calm at the Crimean Coast” and “Chumaks' transporter at Sunset” from the Feodosia Art Gallery. There were also presented landscape paintings “Yalta at night” by Konstantin Korovin, “Alupka. Crimea" by Petr Konchalovsky, "Gathering of gliders in Koktebel" by Vasily Zhuravlev and many other works created on the peninsula. On the park's territory, by the entrance to the Media Center and inside the pavilions you сan find "Moscow now" interactive terminals. They'll help you plan your visit, find your way around the park, check what's on and buy tickets. The terminals will tell you lots about the botanical collection of the park and the history of the district — you will see the famous Moscow landmarks change through time. If you are interested in a promenade around the city center, the terminals will offer you a walking tour along the main streets of the capital and show you a billboard of current cultural events. Moreover, with the help of the terminals you can create and send a post-card.